Mix all the marinade ingredients in a bowl large enough to hold the meat with 1tsp fine salt and 1/2tsp ground black pepper. Place the meat in the bowl, massage the marinade into the meat and chill for at least 6 hours or overnight. Remove from the fridge at least 1 hour before cooking. Heat the oven to 200°C/fan oven 180°C/mark 6. Remove the meat from the bowl and spread the marinade over the base of a roasting tray. Season the meat with 1tsp flaked salt. Heat the oil in a frying pan and sear the meat on both sides for a few minutes to give it some colour. Then lay it out flat in the roasting tray, on top of the marinade. Roast for 25–30 minutes for rare to medium rare. Remove the meat to a plate and leave for at least 20 minutes in a warm place before slicing. Meanwhile, add the wine to the marinade in the roasting tray. Place on the hob over a high heat and scrape the caramelised sediment with a wooden spoon. Let the sauce reduce slightly, then strain it into a warm jug. Add any juices from the resting meat to the jug before serving. Cut the potatoes into 4cm chunks. Bring a saucepan of well-salted water to the boil. Add the potatoes and boil until tender, then drain. Choose a roasting tray big enough to fit the potatoes in one layer with some space around them. Pour the oil into the tray and heat in the oven for 5 minutes until very hot. Carefully add the potatoes, rosemary, garlic and a generous sprinkle of flaked salt. 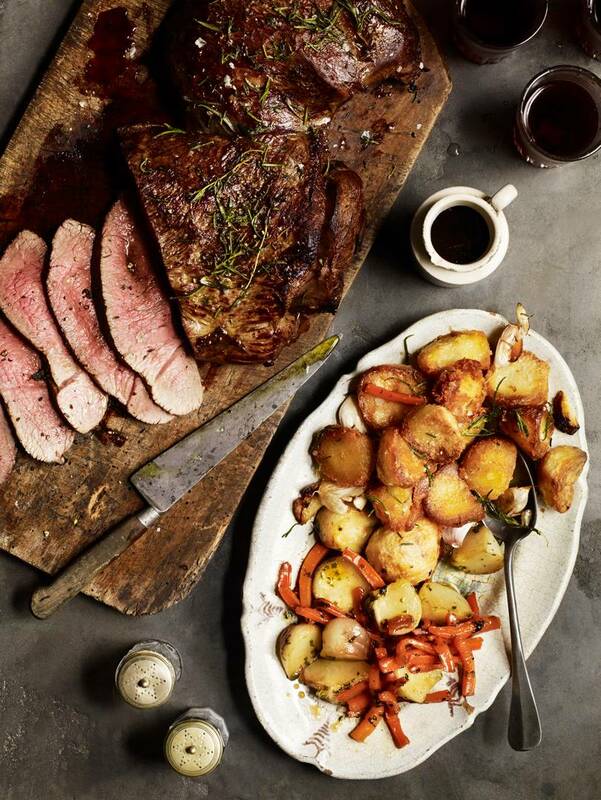 Roast for 25–30 minutes, until the potatoes are well browned and crisp. Only peel the carrots and turnips if their skins are very tough, otherwise just scrub them clean. Cut the turnips into wedges and the carrots into wide batons. Put the vegetables into a pan large enough to fit them in one layer. Add the butter, honey, parsley and salt and spring water to barely cover. Bring to the boil and cook on a high heat at a rapid boil, uncovered for 10-minutes or until the carrots are tender when pierced with a knife. Remove the vegetables and keep warm and continue to boil the liquid to reduce to a syrupy sauce. Serve the vegetables with their reduced cooking juice poured over the top.